Famous for their ability to go head-first down a tree, White-breasted Nuthatch are fascinating to watch. Nuthatches have a unique way of moving on trees and branches. They stick they necks out in a very distinctive way. A wooded area with deciduous trees is the perfect place to look for a White-breasted Nuthatch. Female White-breasted Nuthatch lay up to 10 eggs and then the pair work as a team to incubate them together. White-breasted Nuthatch eat... nuts. They will also eat seeds and suet, but they have a special fondness for suet with nuts mixed in. White-breasted Nuthatch are easy to attract to your yard and have a distinctive look that makes them easy to recognize, once you know what you are looking for. White-breasted Nuthatch have black and white markings, along with grey markings that can often appear to be a blue-grey color and brownish colors on their bellies. The combination of these colors provides great contrast, and this sparrow-sized bird is easy to spot in the forest or at feeders. The only bird that looks similar to a White-breasted Nuthatch is his close relative the Red-breasted Nuthatch. The colors on the chest of the two birds lets you quickly tell the difference. Mixed flocks are common in the bird world because a large flock of birds has a better chance of spotting predators than a single bird. Although territorial towards other Nuthatch, it’s common to see mated pairs in a mixed flock of birds much of the year. They will travel and feed with other small songbirds including chickadees, sparrows and titmice. White-breasted Nuthatch and Red-breasted Nuthatch live in similar parts of the country, so you may see both from time to time (perhaps even in the same winter flock). Look for White-breasted Nuthatch anywhere you might expect to see woodpeckers, as they often are found in similar areas because of their common feeding behaviors. White-breasted Nuthatch prefer to live in deciduous forests made up of oak, maple or hickory trees. They are also comfortable in neighborhoods across America, as they will make their homes near wooded areas, suburban neighborhoods and parks. In addition to their sociable behavior and unique habit of foraging up, down and sideways on trees, White-breasted Nuthatch are also known for their nasally calls, especially during mating season. Male White-breasted Nuthatch will sing to potential mates, and also will bring her food and feed her to gain her approval. Once the pairs have mated, they will stay together year-round. White-breasted Nuthatches are cavity dwellers, and will often nest in old woodpecker holes. The pair may also decide to burrow their own nest cavity or use a well-designed nesting box, where the female will then build a nest. Nests are made from strips of bark, feathers and animal fur. Often extra fur is used to line the nest. The female makes a nest and then lays 5-10 eggs. The pair works together to incubate the eggs for up to 2 weeks, when the eggs should have hatched. White-breasted Nuthatch feed their nestlings insects almost exclusively, and the nestlings tend to leave the nest about 2 weeks after they hatch. Adult White-breasted Nuthatch primarily eat insects and bugs, but they are sure to notice nearby suet feeders and eat at them, using suet to supplement their insect diet. They also eat nuts and seeds, and can be found at well-stocked bird feeders year-round (especially in winter when food becomes more scarce). Nuthatches are named for their habit of jamming a seed or nut into a tight spot, and then hammering it until it opens up or "hatches". 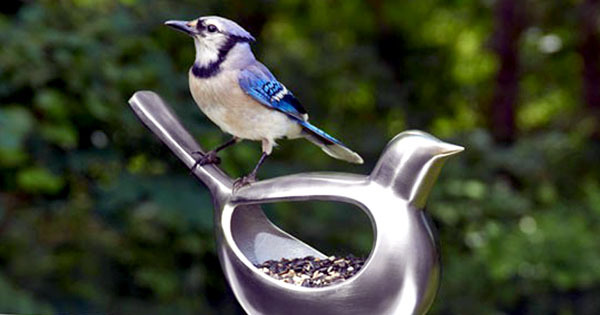 To attract White-breasted Nuthatch to your yard, add a suet feeder. Because of their ability to cling and feed upside down, these colorful birds will eat at almost any suet feeder. 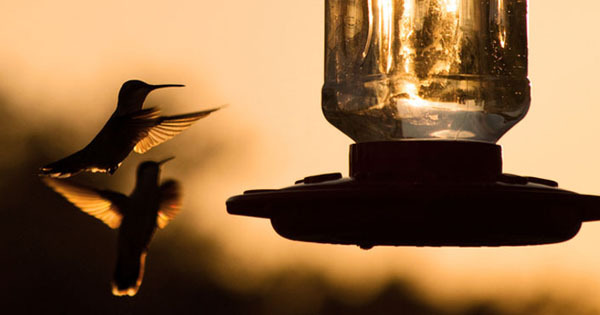 Whether your suet feeder is simple, squirrel-proof or hangs upside down - these agile little birds will have no trouble getting as much food as they want from your bird feeder. White-breasted Nuthatch will even store extra food up for winter. They may hide seeds or nuts in the bark or crevice of a tree, and are able to remember where most of the bird food is hidden when other food becomes harder to find. 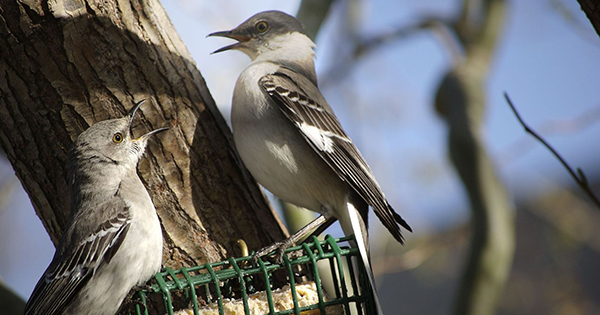 Whether you see a single White-breasted Nuthatch creeping up and down a tree, or notice it as part of a mixed flock eating at your birds feeders, it’s easy to see why these striking birds are a favorite of beginning as well as advanced bird watchers. 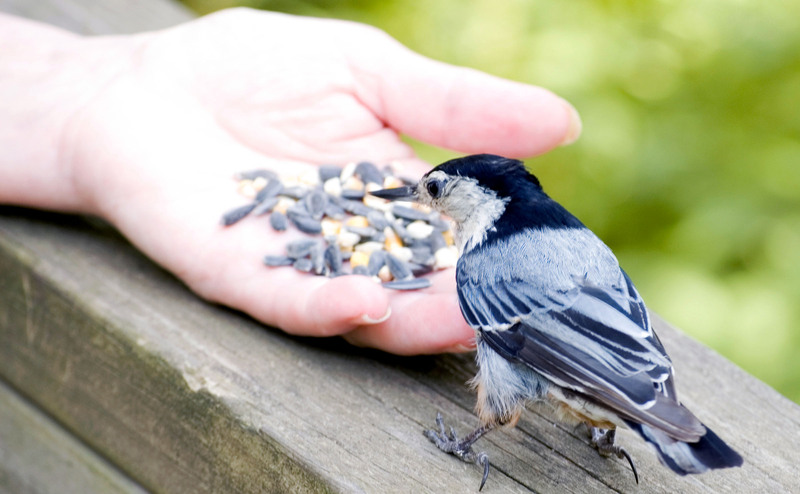 If are you are patient and offer food consistently, you may even be able to convince a White-breasted Nuthatch to eat from your hand.